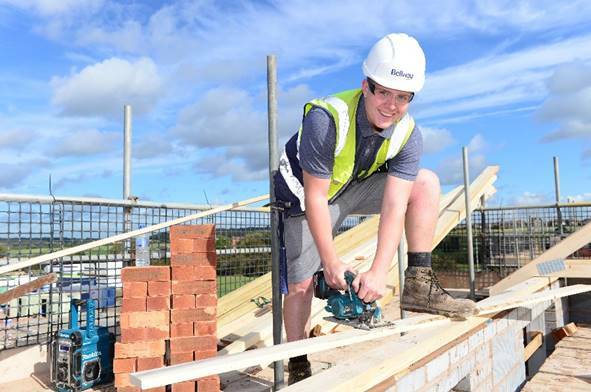 On-site apprentice training rooms and real attention to detail have helped a dedicated site manager for a Leicester-based housebuilder win a major regional award. Dave Monk, site manager at Bellway East Midlands’ Liberty development in Nottingham, has won a ‘best large builder’ award for the entire East of England region from the National House Building Council (NHBC). Bellway East Midlands, which is based at Meridian business park in Leicester, has three other site managers who have also been recognised for their dedication to their work in the NHBC competition. James Dunn, Gary Archer and Dave Pringle have won NHBC Seal of Excellence awards this year. Dave Pringle is in charge at NG2 in West Bridgford, while James runs Sherwood Gate in Linby and Gary oversees the Bellway at Farnsfield site team. Some 60 people, including Dave’s son and one of his daughters, work at the 212-home development, off Chalfont Road. Judging for the awards is meticulous, beginning a year before the announcement of the first round of winners. Each site undergoes spot checks on its day-to-day running, and site managers are assessed across 44 areas of site management, including consistency in the build process, and the quality controls they have in place. Dave’s own philosophy is to ‘set my stall out at the beginning’ and explain to everyone on site what he expects from them. That includes minute attention to detail, like ensuring consistency of wall socket positions and skirting board details in houses across the development. Dave’s other innovations include on-site training rooms for apprentices. He’s also happy to deal directly with build-related queries from Bellway customers. The result of all this care, Dave hopes, is the ability to convert more site visitors into Bellway customers. The site sells two or three homes a week – and as many as 17 in the month of July this year. As a regional winner, Dave and Bellway’s Liberty development in Nottingham is now in the country’s top 10. A national winner will be chosen from those 10 at a dinner in London on January 25, 2019. More information about Bellway’s new homes across the East Midlands region is available at bellway.co.uk.